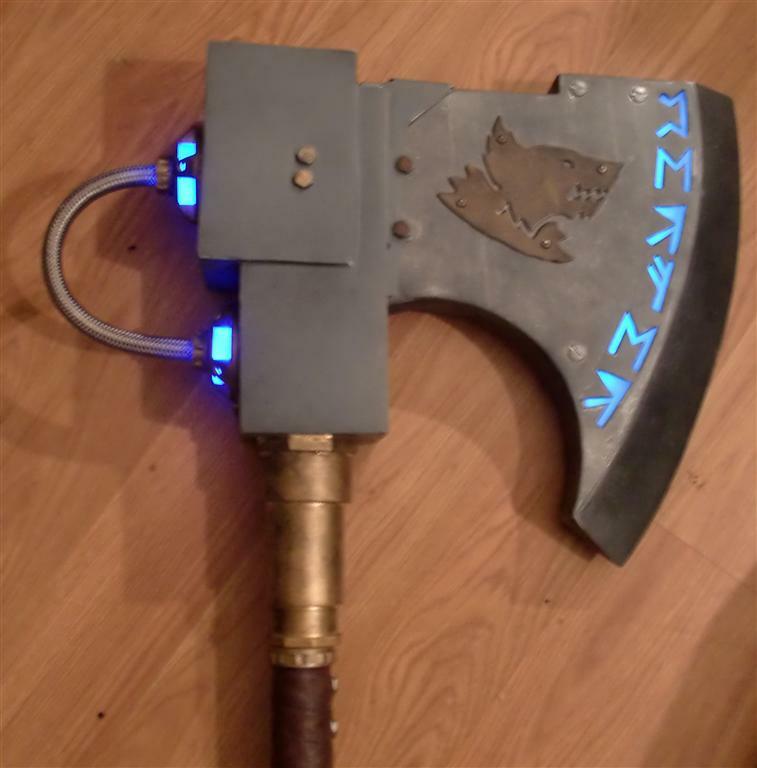 I’ve always been a fan of vikings, so when I got this commission to build a Space Wolves frost axe I was all over it. 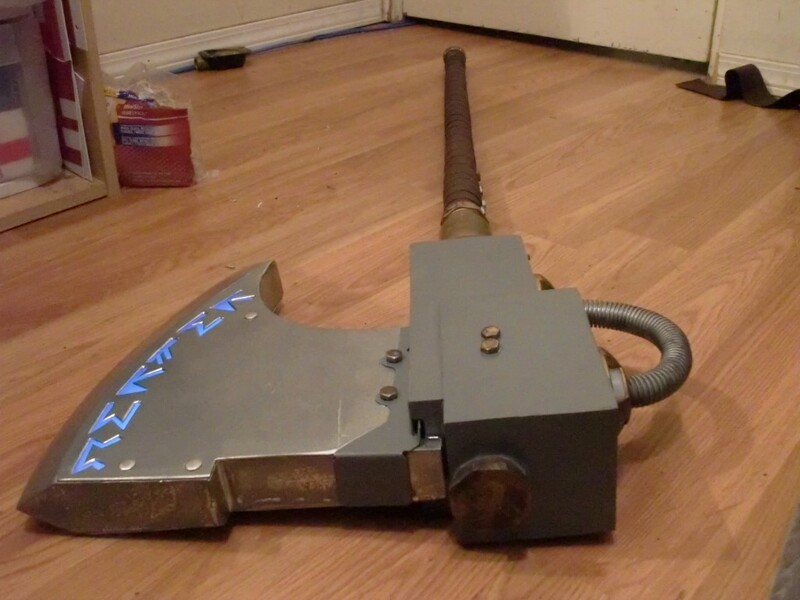 Emperor be praised lets get to cleaving. 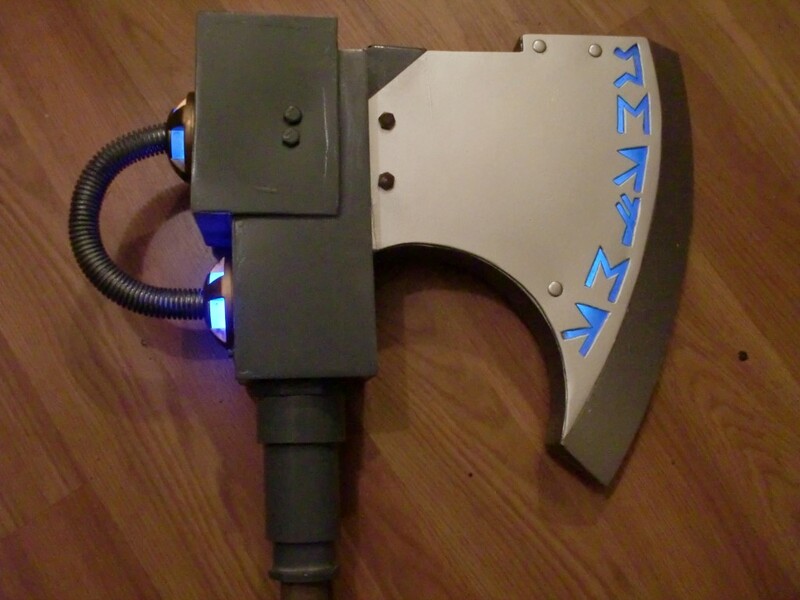 I started digging around, and found an old Power Axe pepakura model someone made (if anyone knows who did let me know! it was years ago!). 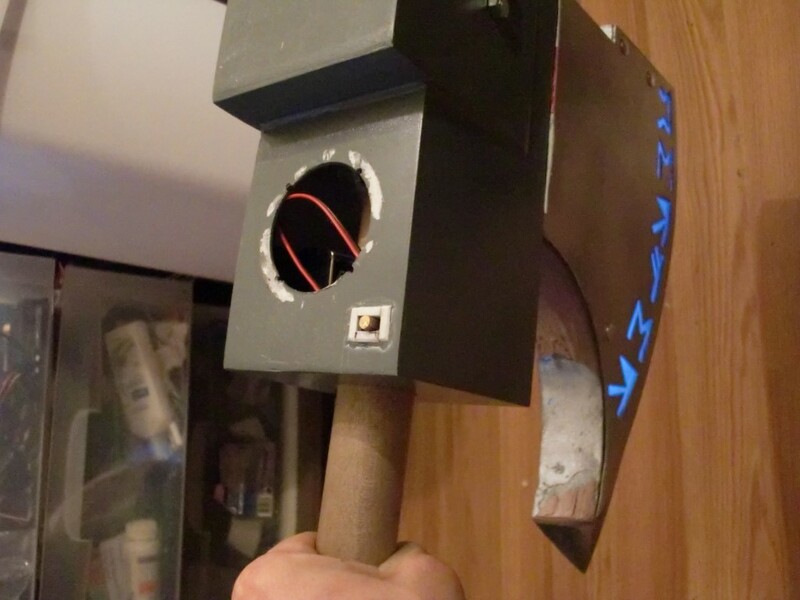 I decided to use this as my axe head base. 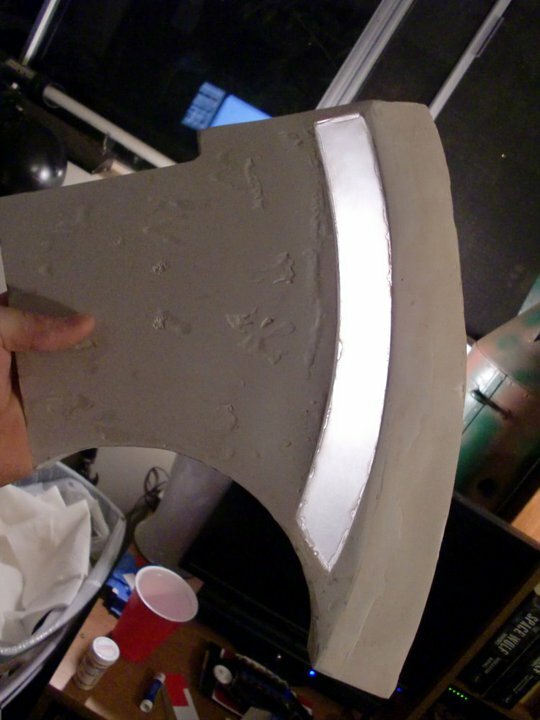 I also cut two channels out of the front part of the axe to give me a space to do lighting for the “runed” part of this prop. 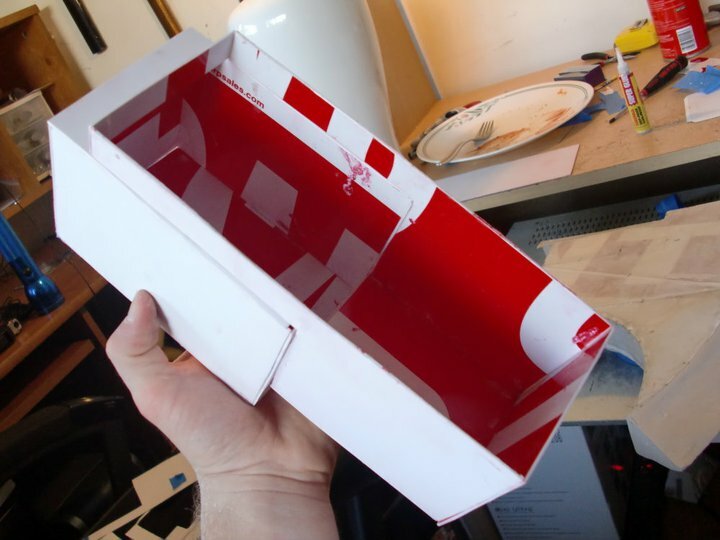 After this was sturdy, I cut out Plexiglass pieces to fit into the channel I had cut out near the front of the blade on either side. I set these into the gaps and filled the seals with glue and bondo, sanding it flush (and making the plexiglass frosted in the process). Light could now pass through the axe tip easily! This picture was it just being held in front of a light. At this point it was time to add the lighting. I had the idea of making glowing runes down the blade, and wanted it to be a weird diffused sort of light instead of just a solid color. 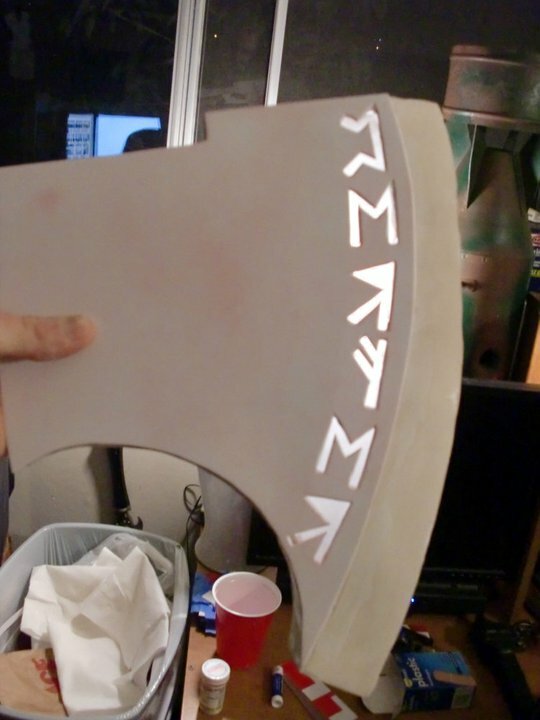 I carved out some runic lettering into the faceplate I’d be using to seal up the axe, and held it up to the light as a test. 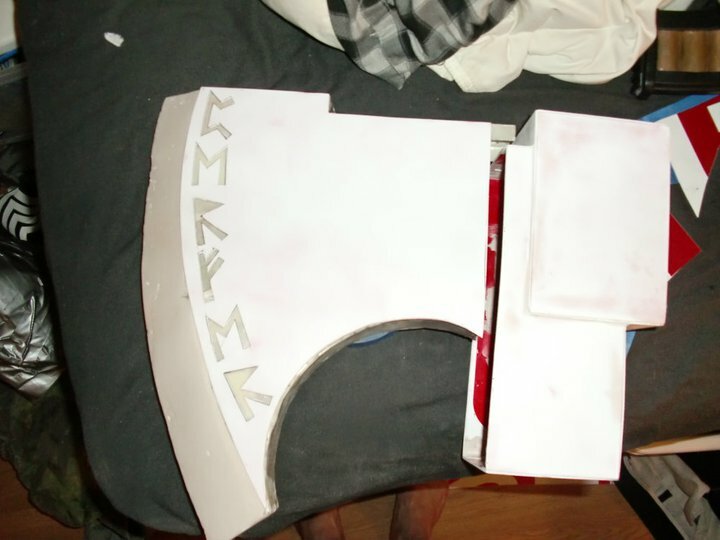 The runes say roughly “Endure”. I had been wanting to play with EL Wire, and this was a prime chance. I bought a length of it, and bundled it up into a bunch of strands about 12″ long. 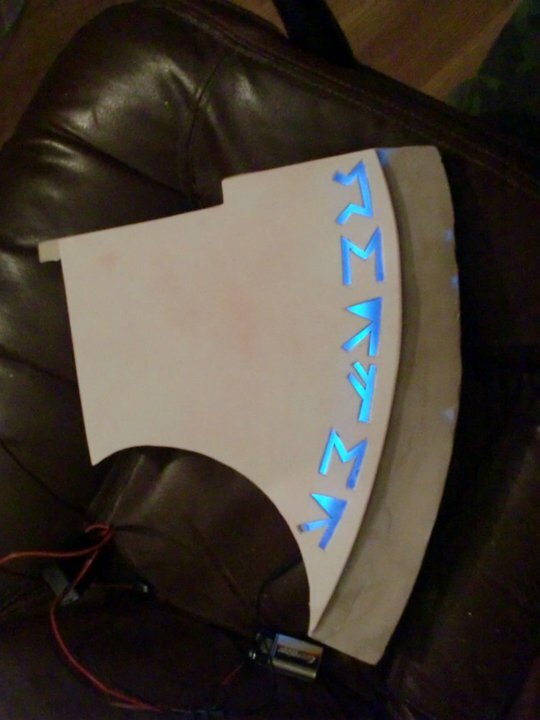 For some reason I didnt take pictures of the bundle, but it was just EL wire folded over EL wire. 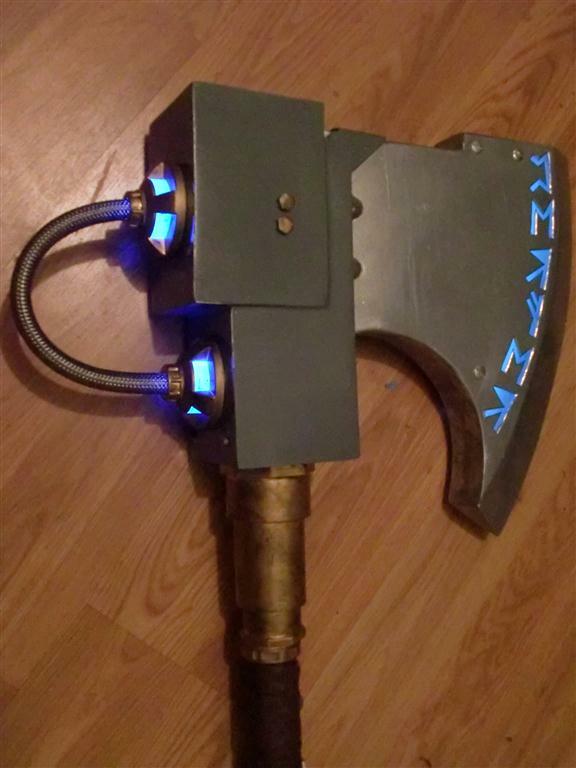 Using the still open side of the axe head, I inserted this bundle of wire and mounted it inside the axe head, hanging from the top of the axe to the bottom, held in place by zip ties, hot glue, superglue and dreams. 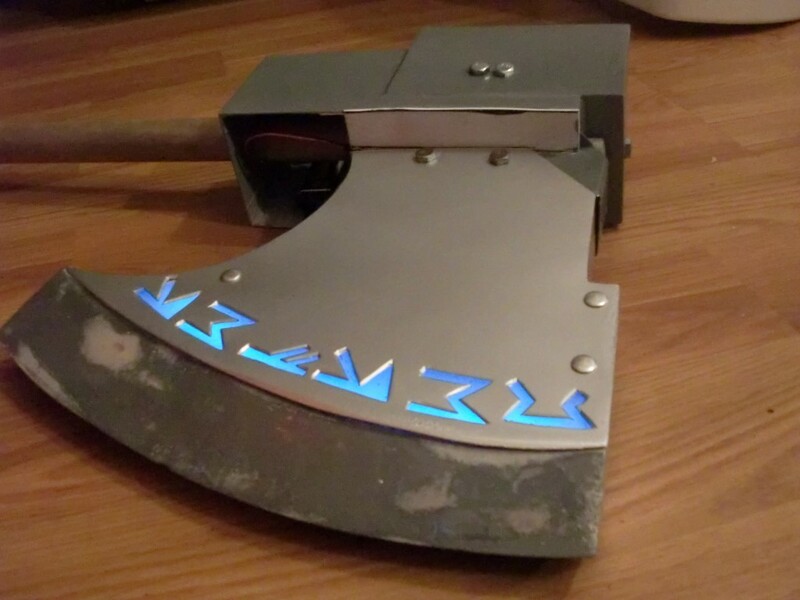 I wanted the lighting to have a sort of eerie diffused look, and this gave a pretty cool effect on both sides of the axe. Shiny. 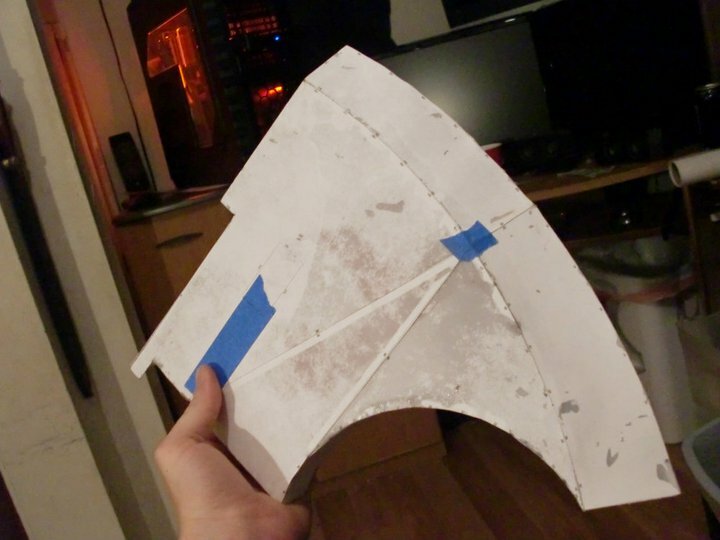 Now it was time to start building the head the blade would rest in. 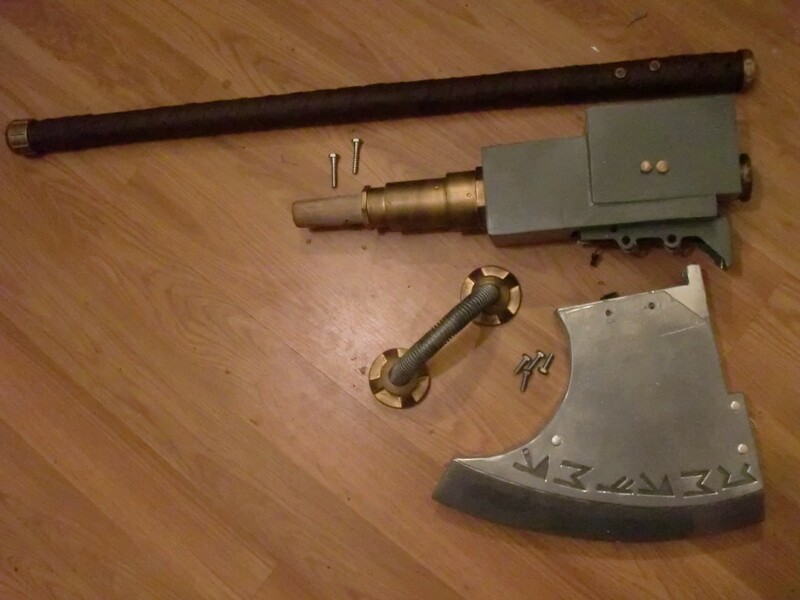 This was a pretty big prop so I needed to make it all come apart for shipping, so I had to get a little creative. 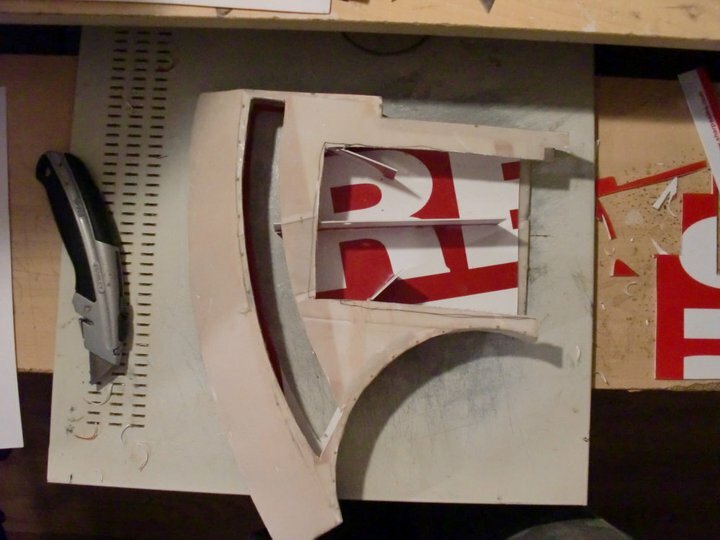 I started by building out the basic shape using Styrene for sale signs. 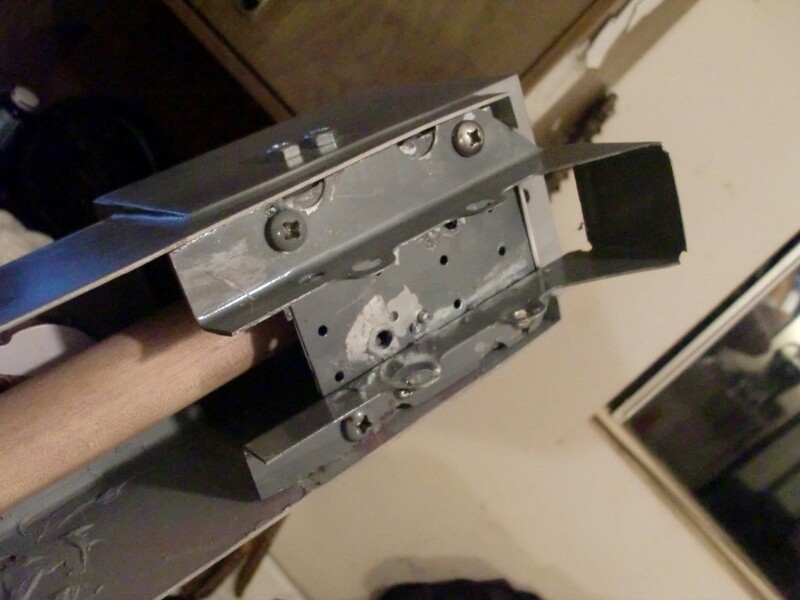 I decided to mount the box to the pole before moving to the next step, and I did this by drilling a hole through the bottom, pushing the rod all the way through and connecting it to the top of the box with bolts driven through the dowel on both the top and the sides. It was super sturdy after this. I found a steel bracket that slid onto the blade in a hardware store and decided to use that as the mount for the blade. 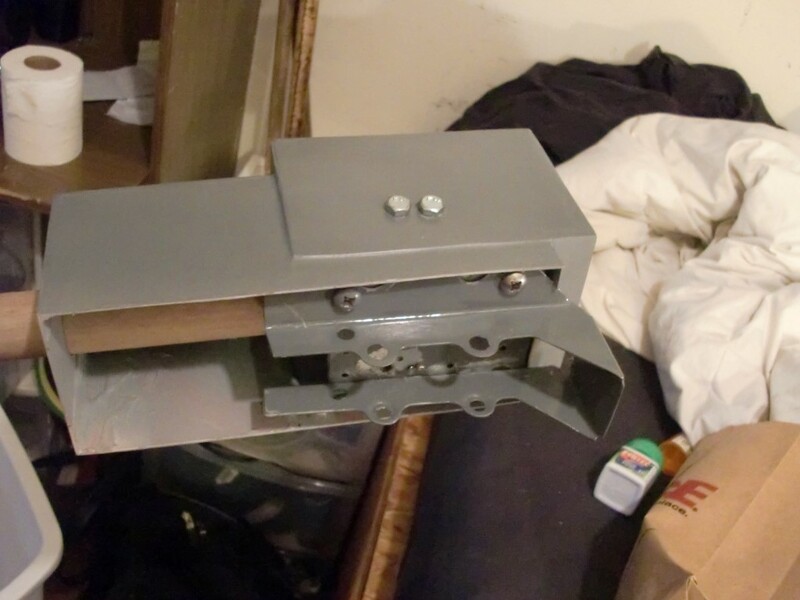 The blade, handle, and top needed to be removable easily for shipping and transportation. After some serious jerry rigging to get the mount to be solidly in place, I was shocked to find it actually worked extremely well and was hilariously durable. Sometimes the ugly jobs get it done the best. 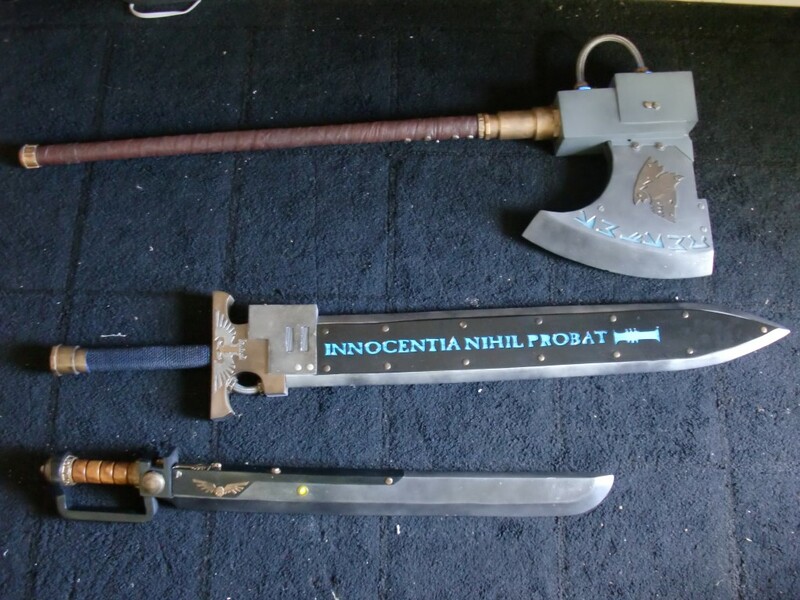 I was able to use my new favorite type of screw, Screw posts, to attach the rune plates to both sides of the blade, and big ol bolts to attach the blade to the handle. 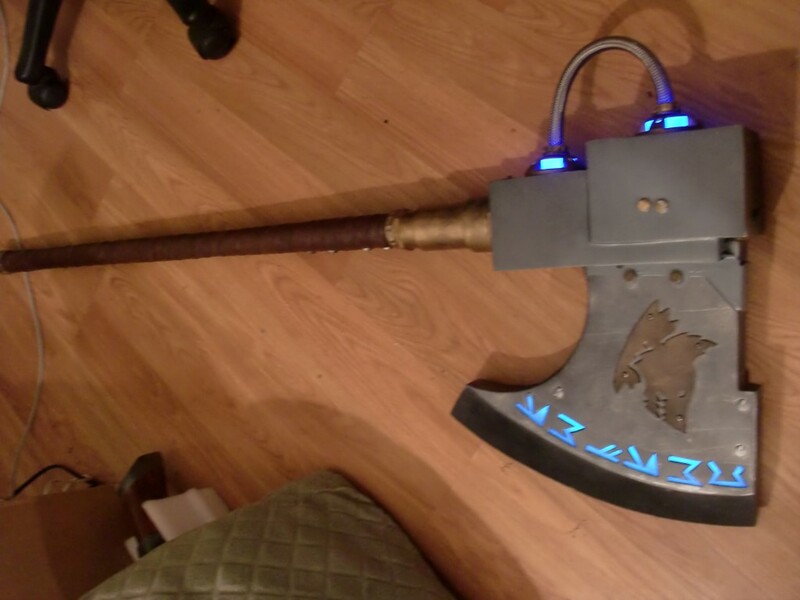 At this point I was finalizing the power cable situation on the back side of the axe, using some flexible tubing and some cool looking nightlights I found at Walmart. After ripping the guts out of these nightlights, I was able to mount them in place in the head in such a way they were removable to get to the batteries and other components. Here is a shot of what I was going for with the power cables! The nightlights had this cool design that let lgiht out of the sides only, I ripped all the guts out and replaced it with a single blue LED, wired those up to a switch and battery and sealed it all up. I painted the lights a weathered gold, painted up the tube and put it all together to see how it looked. Shiny. 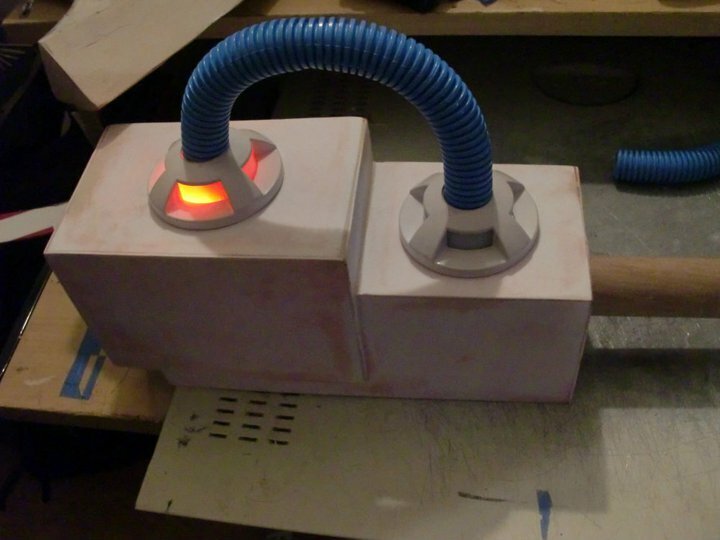 I had also added some PVC pipe fititngs to the bottom section of the head, to add some strength and substance to the part where the dowel meets the power supply. The end of this PVC pip fitting area was made with a metal fitting for toilets (haha) and was solid as hell. 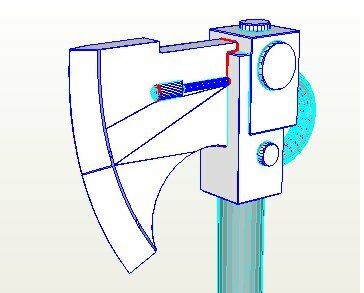 I later used this as a mounting point to make the entire handle removable! 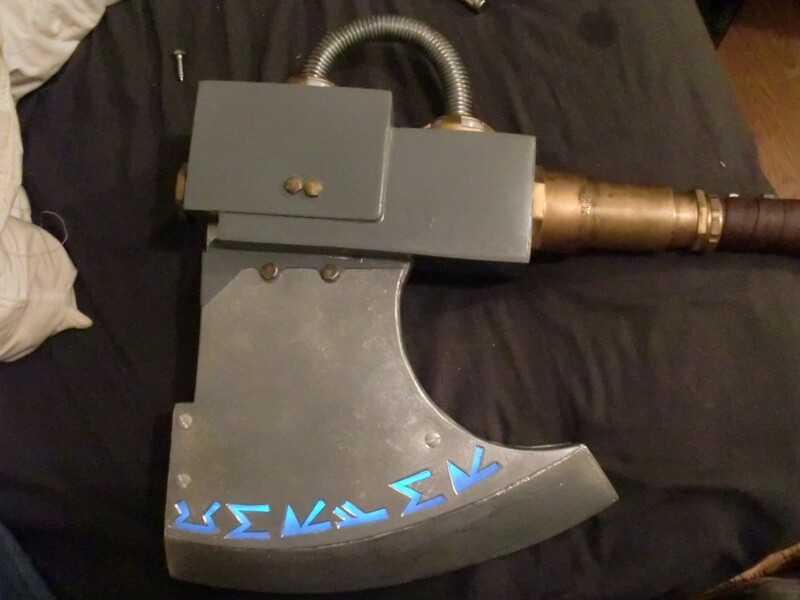 After fitting it all together, it was time to finish up the paintjob. I weathered the hell out of the silver blade, giving it an aged metal look (wet sanding metallic paints with fine grit gives a pretty cool effect), sealed everything up and wrapped the handle. I painted the fittings underneath the head an aged gold, and generally tidied up the color scheme.. it is approaching completion! At some point I switched the tubing on the back out for a flexible metal tubing, and ran all the wiring through it so the whole light up section was detachable. This worked out way better then the way I had it before, and enabled me to completely take this thing apart for easy shipping. See a picture of it broken down below. 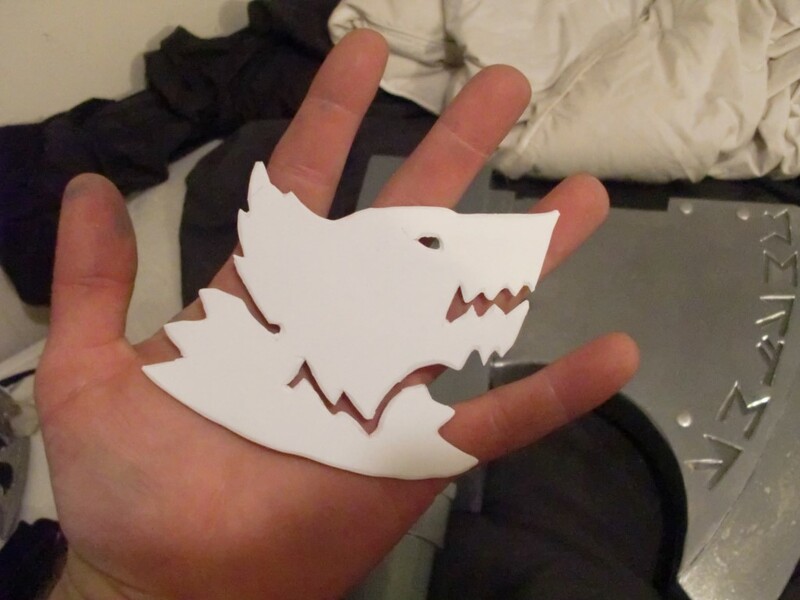 Annddd some final adjustments and.. heraldry! Emperor be praised, my work is done.